By Himanshu Kumar* Three young girls were allegedly chased, beaten, made to march for eight hours and locked up in a police station. Next day, they were sent 400 km from their homes. A note put up before a magistrate in Dantewada by three adivasi women, Somdi, Gangi and Lakme, recounts the events of April 27 that have resulted in their daughters – three minor girls, one aged 15, the other two aged 17 – being taken 400 kilometres away by the police. According to the note, the three girls left their homes together in the morning to graze their buffalo and take a dip in the river. They had walked only about a kilometre from their homes in Kormagondi village in Chhattisgarh's Sukma district when they saw a large number of security men emerging from the nearby forest, upon which they simply turned their heels and ran back in the direction of their homes. The personnel of the Special Task Force of Chhattisgarh police and the Central Reserve Police Force allegedly chased them into their homes and dragged them out, beating them in the process. After a walk of eight hours from the village where the three girls were ‘captured’, the force deposited them at the Kukanar police station, which is 21 kms away. On the way they caught hold of another boy, Muda Banjami, about 25 years old, and brought him to the thana along with them. The next day, the girls were produced before a magistrate and sent to an observation home, 400 kilometres away. "‘Why did the girls run?" asked Prakash Rathod, the station supervisor. "Obviously, they were guilty of something. Why were they in the forest? Only ‘sangdih log’ (suspicious persons) roam around in the forest," he said. "The force had gone on a ‘gasht’ (search). Some 25 naxalites were there and they started firing, the forced chased and caught these girls and the boy," added SS Sori, the sub-inspector at Kukanar. The policemen denied the girls were taken from their homes. When the young girls were taken in custody, the village women said they protested and asked why they were being taken away. "All we got was beatings, not explanation," said Hadme Podiyami, the aunt of one of the girls, displaying the blue clotted wounds on her thighs. "We kept following the force from a distance as the girls were taken in and reached the thana in the evening." As news spread, a large number of adivasis from nearby villages of Chikpal, Mardum, Tatiras, Gadam, Arjali, Parcheli, Kunna, Pedapara gathered around the thana. Women joined in large numbers. 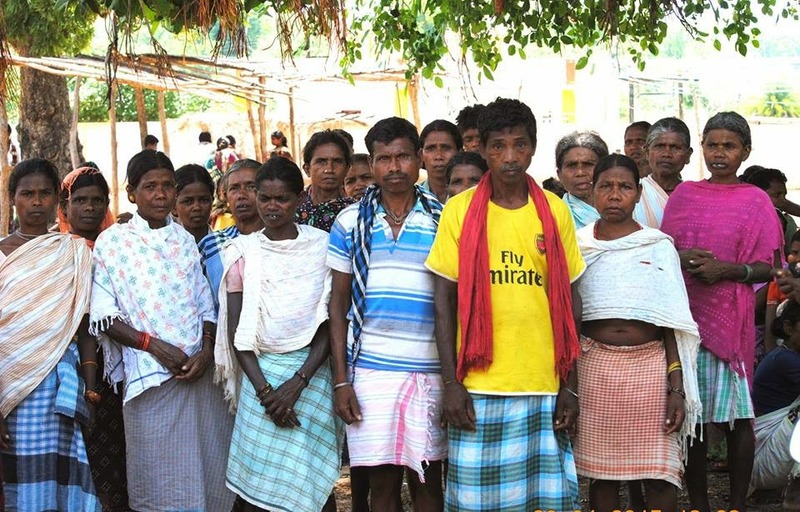 "It is quite natural for any adivasi to run away, when they see force, especially in such large number, approach their villages," said Kishore, a young man who had joined from Chikpal in solidarity with the protesting women. "The force here does not inspire trust, but fear." Despite their plea, the girls’ relatives were not allowed to meet with them. The entire night and the following day, the villagers continued to be near the thana. They had assembled peacefully and did not disrupt the traffic on NH 30, the national highway that connects Chhattisgarh and Andhra Pradesh. The three girls and the boy were kept in the thana overnight. "We called in three women police personnel from Sukma and cleared a family quarters in the police quarters for them to rest the night," said Rathod, the station supervisor, when asked what security the thana has for detaining minor girls. What crime had the girls committed to warrant the arrests? "They have been involved in 'aag jani' (arson) in Lakhapal village last year and they confessed to it,” he said. Charges pressed against them include sections 147 (punishment for rioting), 148 (rioting armed with deadly weapons), 149 (unlawful assembly), 323 (wrongful restraint) and 435 (mischief by fire or explosive substance with intent to cause damage) of the IPC and Sections 25 and 27 of the Arms Act. By keeping the girls in lock-up overnight, the police have completely violated the Juvenile Justice (Care and Protection of Children) Act, said Isha Khandelwal, the advocate from the Jagdalpur Legal Aid Group, who reached Dantewada to help the parents file their bail petition. As per rule 11(2) of the Act, the police is required to inform the parents of the juvenile and present him or her before the District Juvenile Board within 24 hours of the arrest. Rule 11(3) clearly mentions: "The police apprehending a juvenile in conflict with law shall in no case send the juvenile in lock-up or delay his/her charge being transferred to the Juvenile or the Child Welfare Officer from the nearest police station, if such an officer has been designated." In this case, the joint force of CRPF and STF took the girls in their custody around noon on April 27, made them walk for eight long hours before depositing them in the Kukanar thana, where they were kept in police lockup overnight. Since Sukma was part of Dantewada district until three years ago, it shares a common Juvenile Board. Although the magistrate appointed to board sits for hearings once a week, every Wednesday, in situations when the board is not sitting, section11(10) of the Act makes provision for the juvenile to be presented before a single member of the board. "But since the arrested included a mix of both juvenile and adult (three juvenile girls and one adult boy), and since the magistrate in Sukma also has the power to give remand to the juvenile cases, we decided, as we practiced in an earlier case to bring all of them before him," said Rathod. But Khandelwal maintained that the police had flouted rules. "Clearly, the police and the para-military forces, in their zeal to outperform their duties, have blatantly flouted basic rules applicable under any circumstances," she said. The next day, in the absence of a home for juvenile girls in the whole of Bastar region, the magistrate in Sukma pronounced that the girls be sent to an observation home in Rajnandgaon district, 400 kilometres away. Under the law, every district must have an observation home for juveniles who have violated the law. Sprawled over an area larger than the state of Kerala, Bastar region has seven districts, but not a single home for girls. The lack of a robust juvenile justice system is alarming since the region is in the grip of a Maoist insurgency which has enlisted young adivasis as cadres. Often, the police is unable to distinguish between Maoist cadres and ordinary adivasis, and arrests and detentions of innocent people have become commonplace. Nervous at the gathering protest over the arrests of the three girls, Rathod attempted to downplay the polcie action. "Since they are juveniles, they will be granted bail soon," he said. Soni Sori, member of the Aam Aadmi Party, claimed he had reached out to her to diffuse the protest. "I was unaware of the situation until I read about the protest in the local papers and soon after the TI [thana-incharge] of Kukanar called, requesting me to convince the parents to reach Dantewada to apply for bail for the three girls," said Soni Sori, talking over the phone on her way to Dantewada. After two-and-a-half days of sitting outside the police station, the villagers returned home after they were told that the matter now lies with the Juvenile court in Dantewada. The distressed parents have filed for bail of the young girls. The bail decision will be taken on May 6.